Buy Jovees Eye Contour Cream Witch Hazel & Almond Rehydrate, Nourish Skin under Eyes, Minimize and remove Dark Circles, Puffiness under Eyes. Help to minimize and remove dark circles, puffiness under eyes. 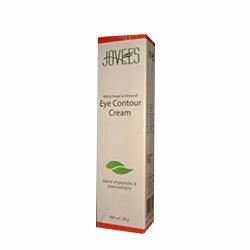 Jovees Eye Contour Cream Witch Hazel & Almond Blend of Peptides & Plant Extracts The perfect blend of peptides, plant derivatives, herbs that shall help rehydrate, nourish the skin under eyes, help minimize and remove dark circles, puffiness under the eyes. Witch Hazel ext, Almond, Rose ext, Carrot Oil, Apricot Oil, Nutmeg Oil, Lemon ext, Aloevera ext.